During the Summer of 2016, Michael Rosamilia and Alex Lee participated in the DukeEngage group program in Turkey, and partnered with DEKAMER, a sea turtle rescue center located in Dalyan. This April, Rosamilia presented their work at the 2017 International Sea Turtle Symposium. The conference, which was held in Las Vegas, unites a community of people working in the field to help leverage conservation efforts through promotion of research, networking, and training. 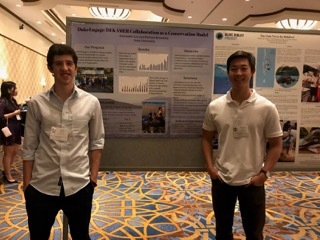 “It was a fantastic experience… ” said Rosamilia, “…full of people extremely passionate about sea turtle research and conservation.” He also noted that conference was a great opportunity to represent and inform others about the DukeEngage program.